Indoor planting is now the ideal way of growing crops with more growing seasons, and better production. The equipment you use inside the grow room play a critical role in ensuring the health of plants. As the plants grow, caring for them becomes a little more difficult than when they were young. The plants demand more carbon dioxide to photosynthesise, process the necessary energy and nutrients for growth. The best inline fan for grow rooms keeps the indoor air fresh by moving and changing it. We tell you more about inline fans and suggest some of the best you can get for your indoor plants. 4 Which is the Ideal Inline Fan? For the best quality products from your indoor garden, you need efficient equipment that includes inline fans. 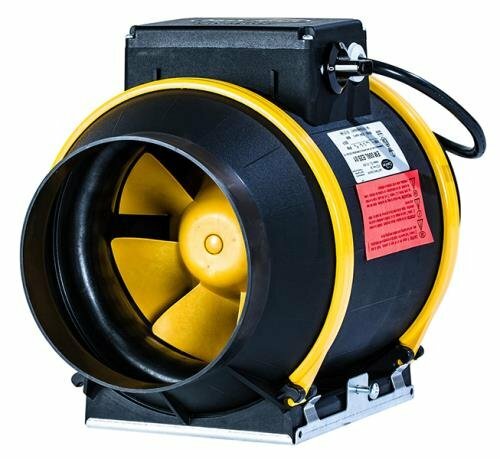 Can Fan Pro Series 420 CFM Max Fan, 6″ is among the best inline fans for grow rooms based on its quality and functionality – it is one product with the best value for money. It features EZ mount bracket that makes mounting an easy task. The fan has a durable housing to protect the internal components adequately. It is powerful and produces a strong velocity air to keep the plants happy. The inline fan that features among others, a durable ceramic coating is one of the best by all accounts. But what does the coating do? Well, the ceramic coating protects the fan from corrosion and rust as a result of the moisture inside the grow room. The product also features thermal protection for the AC motor meaning that you will not wake up one day to find a malfunctioned fan as a result of overheating. It is quiet and will keep your cultivation in low profile – some high-value plants are best away from the notice of everyone. 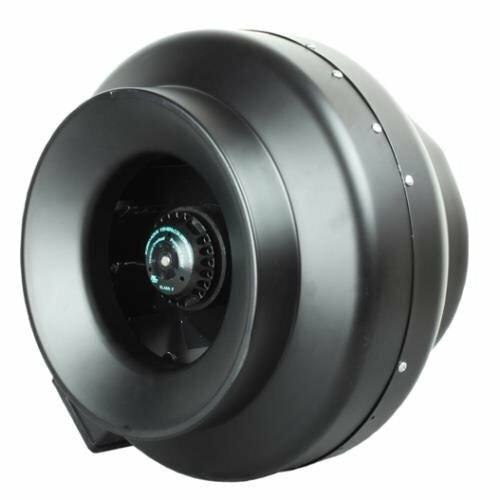 There are only a few select products with the necessary power for commercial use and Hurricane Inline Fan 12 in 1060 CFM – 736590 is among the most powerful. Housed by powder-coated steel, the fan is quite durable and will provide you with a significant amount of service. It contains quality UL parts that ensure the fan does not produce any disruptive noise. The inline fan is also easy to install and will only take a few minutes to get started. It is another powerful fan that provides sufficient breeze to keep the plants happy and growing as they should. It circulates fresh air around the room making it a hospitable environment for the plants. The fan boasts an intelligent controller that makes the device efficient and convenient. It has a backup memory, alarms, speed control and thermostat programming. The machine is also quiet, and that makes it a great addition to any grow room. It has a DC motor which helps achieve energy efficiency and quietness – it is a joy to have around. TerraBroom is among the best fans and other indoor equipment manufacturers, and you can be sure you are getting quality. 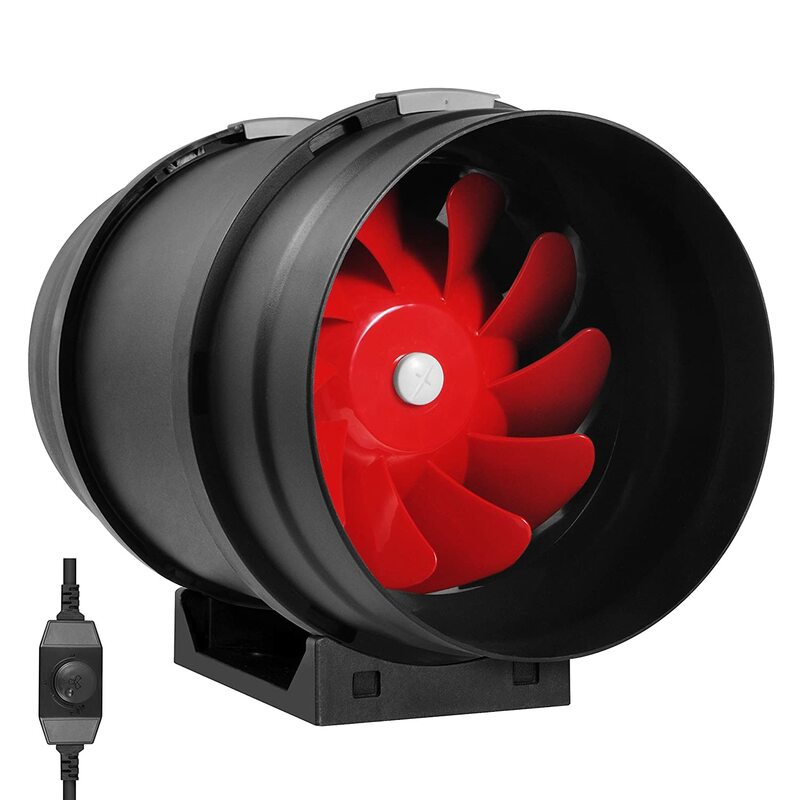 The inline fan is truly versatile as you can use it as a cooling fan, carbon filter fan, intake fan and exhaust fan. It also comes with a variable fan speed control so that you can choose the right speed for the fan. The indoor grow environment can have some problems here and there, associated with heat and insufficient air circulation. Inline fans prevent the buildup of heat, too much humidity, and the development of mould – factors that can as well destroy an entire crop and affect its thriving. But where does the heat come from? Indoor grow rooms need light fixtures to provide sufficient wavelengths that the plants need to photosynthesise. Unfortunately, these lights produce heat which can have negative effects on the plants. No doubt some grow lights have more heat than others, but all of them emit some heat, and so ventilation is critical. Humidity is the water vapour that plants produce as they transpire. A high amount of it can lead to problems such as pests and diseases, as well as, affect the growth of plants. A decent ventilation system that includes an inline fan wick away some of this water inside the grow room, allowing the plants to pull up more water from the soil along with nutrients, resulting in better plant growth. Some pests and diseases take advantage of poor air circulation and high humidity to invade your indoor crops. Pests such as spider mites, fungus and gnats prefer humid conditions to thrive. They lay their eggs on the moist soil, helping in their reproduction. A good inline fan helps keep the soil free of excess moisture by driving some of it away from the soil, thereby disrupting the pests’ reproductive cycle. A steady breeze makes it difficult for the pests to establish a colony in the grow room. Plants need a good supply of external air to access carbon dioxide on a daily basis. If your grow room does not have a free flow of air, then there is an inherent risk to your plant’s growth. You see, the plants require carbon dioxide to process nutrients and energy, and an insufficient amount of it can lead to stunted growth. Fans play a critical role in getting rid of old air and bringing a new one with a sufficient CO2 content. The outdoor grown plants have to deal with the wind constantly, and that makes them stronger. Without an indoor fan to continually shake the plants, they can grow weak even to handle the weight of their own produce. Therefore, an inline fan helps strengthen their stems. Which is the Ideal Inline Fan? Knowing what to look for in a potential inline fan can be the difference between a knock-off and a quality product. Well, calculating the CFM of the fan helps determine the best one for the crops. 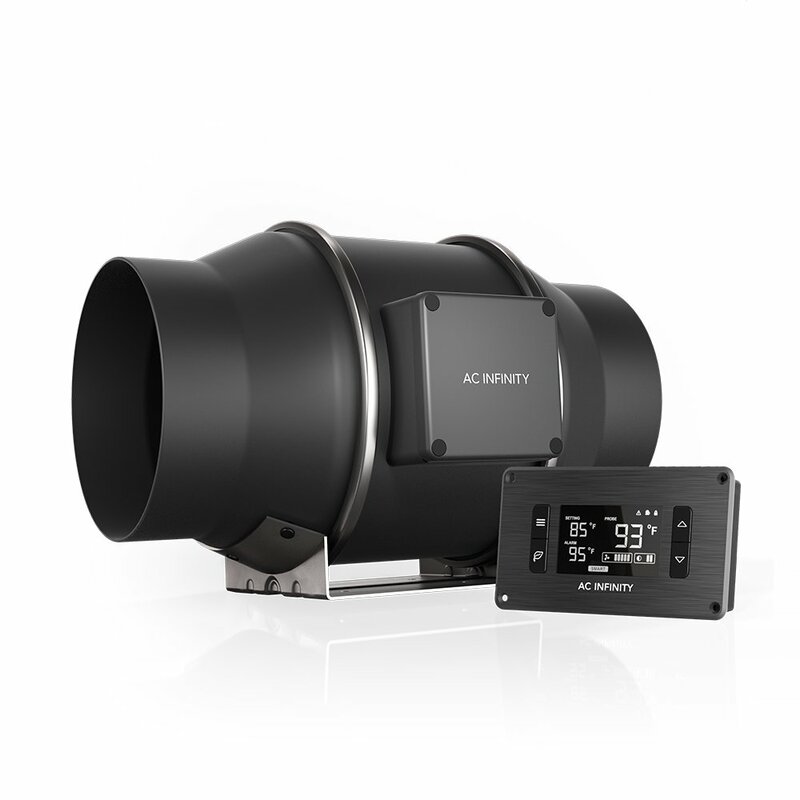 The best inline fan will depend on the size of your grow room and exhaust efficiency. There is a bit of math here, but it’s simple. First, calculate the volume of grow room by multiplying the length, width and height. The next step is to calculate the efficiency drop of the grow room – it’s not rocket science! Depending on the age of the filter and the length of the duct between the fan and filter, multiply the efficiency drop with the volume of the grow room to get the cubic feet per meter (CFM). In most cases, you multiply the volume of the room with two if the duct path is short and three if it is long. For example, if the volume of your grow room is 250 cubic feet and the duct path is short, then the CFM is 500 (250 x 2). 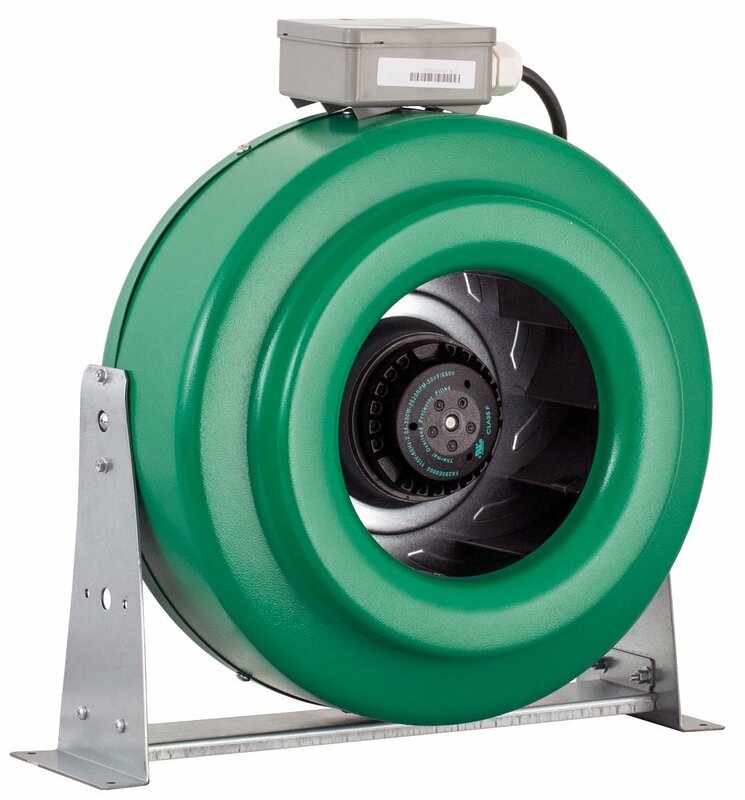 The ideal fan for your grow room will, therefore, have a higher CFM than the calculated figure – higher than (500 CFM). Most grow systems do well with flexible aluminium ducting. It is cheap and reactively easy to install. But you can as well choose other varieties depending on budget and preferences. The important thing to remember is that small size ducts are inefficient. More length and bends create air resistance, thereby affecting airflow. To make it more efficient, you smoothen out the wrinkles, reduce the number of turns and shorten the length. Your grow room deserves the best inline fan like Can Fan Pro Series 420 CFM Max Fan, 6″ that has all the features you will need. While the other fans in this write up would make a decent choice, this particular product boasts three variable speeds, a decent mounting bracket, and durable housing. More importantly, the powerful fan circulates a gentle breeze within the grow room to ensure the plants are always healthy.